In my last post on headers, I suggested a rationale for faculty focused accessibility training. In short, I believe it is each faculty developer’s responsibility to ensure that the digital materials they provide are accessible. This article will take a look at the “alt attribute” (alt is short for alternative). The alt attribute provides a text-based alternative for audiences who are not able to access the visual information contained within an image. FYI: The alt attribute is often incorrectly referred to as an “alt tag”. The HTML code for every image must contain at least two pieces of specific information (required since HTML version 4.0): an image’s web address (URL) and its alt attribute. With this information, your web browser can find, display, and if necessary, describe an image’s content. Example of image load failure, with alt text displayed. 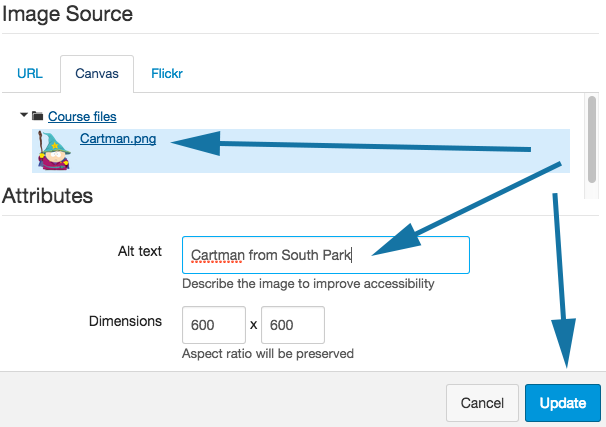 Let’s look at the code your web browser is using to render this Cartman image. 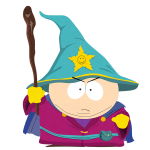 <img src="http://musictoolbox.org/wp-content/uploads/2015/05/Cartman.png" alt="Cartman from South Park">. 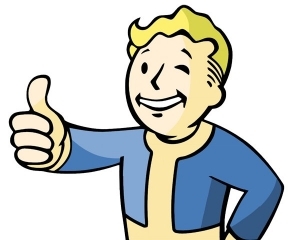 An image’s alt text will be displayed when an image fails to load. It is also the text that will be read aloud by screen reading software. If the Cartman image failed to load (see example image to left), the sighted viewer would be presented with a broken image icon and the alt text, “Cartman from South Park.” Whether or not an image loads, the visually impaired user will hear the alt text read aloud by the screen reader. Screen readers can only translate written text into spoken word. As such, it is impossible for a screen reader to interpret the visual content contained in an image. In order to meet ADA accessibility standards, a blind learner needs to be provided with the “text equivalent” of this visual content. Each instructor needs to determine what information the visually impaired learner will miss by not seeing an image. Alt text does not necessarily need to be a detailed description of an image’s visual content. A well-written alt text will provide learners with equivalent content, tailored to fit within a course’s context. To demonstrate this point, try this. Which of the following alt text samples is appropriate for this image? Which alt text is appropriate? An image of the gardens surrounding Versailles. The gardens at Versailles exhibit the sorts of excesses that led to the French Revolution. The exuberance, riotous surface detail, and symmetry that typify the Baroque are present in landscape architecture of the period and the works of J S Bach. 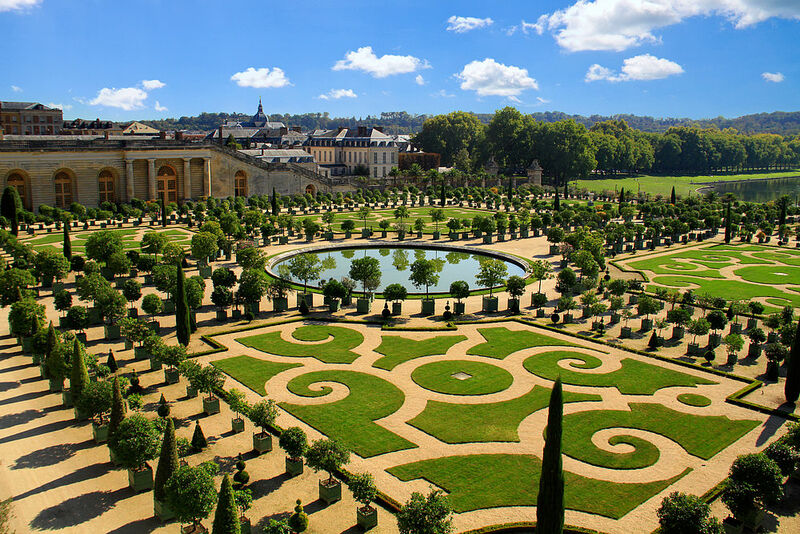 Visitors will enjoy our beautiful walking tour of the gardens at Versailles. All of these options are appropriate, depending on the nature of the class. Appropriate for a general humanities class (more decorative that informative). Appropriate for a class covering European historical trends. Appropriate for an Art/Architectural History class. Appropriate for a Music appreciation class. Appropriate for a travel agency’s website. All images must contain alt text. Alt text is an HTML standard and required for accessibility. When an image serves only a decorative function, it should be left empty (alt=""). This referred to as “null.” It is considered to contain any pertinent information. Remember though that the (alt="")still needs to be included as an HTML standard. Abbreviations in alt text are fine if formatted correctly. Each letter in the abbreviation needs to be separated by a space. For instance, alt="E R A" would be read as E. R. A. (earned run average), while alt="ERA" could be interpreted as the word “era.” How a screen reader speaks ERA depends on the particular “voice” algorithm the learner has chosen. It is best to limit the duration of alt text to 125 characters (including spaces). Older versions of JAWS, one of the most popular screen readers, will sometimes break-up longer descriptions into multiple 125 character segments. Long descriptions may create confusion for learners since breaks sometimes occur within words or between sentences. If an image requires a significant amount of explanation, consider including this comment within the lesson. All the learners in your class, sighted and blind, might benefit from this added information. (longdesc="") is another attribute that can add to an image’s code. This attribute points learners to an additional web page or file where a longer text description resides. Let’s insert the longdesc attribute to the Cartman image code. <img src="http://musictoolbox.org/wp-content/uploads/2015/05/Cartman.png" alt="Cartman from South Park" longdec="http://en.wikipedia.org/wiki/Eric_Cartman">. This added element allows an instructor to provide a visually impaired learner with an expanded description. I chose to link to Cartman’s wiki page. In MS Word, the “description” box is where your alt text should go. It is not necessary to include a title. Remember to limit your text to 125 characters. In MS Word, the alt text “null” will not cause a screen reader to skip a picture. If you are ultimately translating your word doc file into a pdf, use the term “decorative” in the description box. When reading a pdf, a screen reader will skip an image with the “decorative” alt text. Note: If you are using a PC, an exported pdf file will retain alt text. If you are a Mac user, an exported pdf will not retain alt text. Mac users should save their documents to a flash drive, open them on a PC, before exporting as a pdf. All LMSs allow you to add alt text to a picture. The above image shows alt text being added in Canvas, and below, alt text is added into Pearson’s eCollege. Pearson’s eCollege refers to alt text as “descriptive text”. In an LMS, there are three steps required to add alt text. 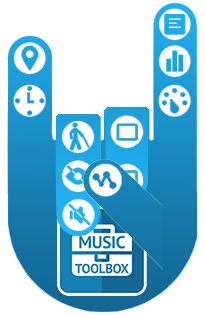 Alt text is easy to add and provides real and valuable assistance to visually impaired learners. Remember, alt text needs to offer textual equivalence. Well-written alt text will supply learners with equivalent content, tailored to fit within a course’s context. Let’s get out there and be accessibility savvy!